This is a story of illness and magic from the fourth century CE. Even though Constantine had converted the Roman Empire to Christianity, paganism didn’t just lie down and die. One of the most famous pagan intellectuals was Libanius, a distinguished orator who taught rhetoric to famous Christian figures such as Basil the Great and John Chrystostom. Born in Antioch in Syria, Libanius’ life spanned the century. He returned to his home city in 354 to teach, and remained there until he died. He decided not to mention to any physician what had happened; he wasn’t keen on ‘being dragged from my usual routine to take medicine or undergo professional treatment’. Later, he decided that this had been the wrong decision, as his reluctance had meant that the fear took root more deeply. In his 50s, he suffered from both migraine and gout, and developed a fear of crowds with dizziness and difficulty in breathing (Oration 1, ch.141). He continued to trace his migraines back to the thunderbolt incident. After a 16-year remission, which he attributed to the healing god Asclepius, he had a particularly bad attack in his early 70s, in 386, and found he was unable to read, write or speak in class (Oration 1, ch.243). This reminds us of the second-century CE rhetor, Aelius Aristides, who like Libanius wrote about his own experiences as someone whose career depended on public speaking but who was unable to do this during acute episodes of illness. Aelius Aristides similarly found that his time at the sanctuary of the healing god Asclepius helped him to cope. For example, in a dream the god suggested having a choir who could start to sing at points when Aristides’ voice was weakening. Libanius found a rather different way of coping. He experienced a disturbing dream about murder which he saw as evidence that magic was being used against him by a rival. Soon afterwards, a (very) dead chameleon was found in his classroom, with its head pushed between its back legs, and one of its front legs over its mouth, as if to silence it (Oration 1, ch.141). The other front leg was missing. The wrongly-positioned head may have suggested to him that this was connected with his migraine, and the blockage of the mouth his difficulty speaking. The missing front leg may have recalled his gout, or perhaps the arm with which he would gesticulate while speaking in public. Chameleons have long been considered as very strange animals. Pliny’s Natural History (8.51) describes them not only in terms of their capacity to change colour, but also as bloodless, their mouths always open as they are nourished by the air alone. 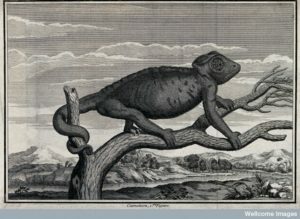 Libanius was in any case convinced that his illness at this point was magical in origin, caused by a rival, and finding the chameleon confirmed his fears. However, because he found he felt better after this incident, he assumed this meant that those who were trying to harm him had eased off their magical practices. And that, in turn, made him feel even better! Next postWho Keeps Women’s Secrets?